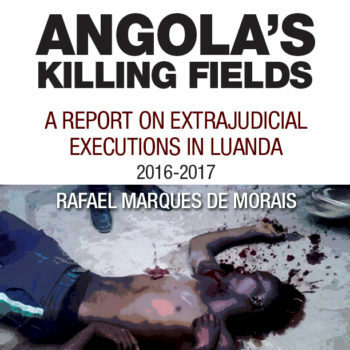 From Angola comes yet another report of out-of-control police officers shooting at demonstrators. Three students were wounded, one of them seriously, when police officers opened fire without warning as the youngsters were taking part in a protest march last week in the central Angolan town of Caluquembe, in the province of Huíla. The students were protesting over demands for extra money in connection with their studies, after a local authority meeting decreed that emoluments would be added to tuition fees. They were also protesting at the summary dismissal of teachers who did not go along with the move. Two of the injured were named as 17-year-old Paulo Alfredo Cabral, a student of economics and law at the Novo Horizonte college and 21-year-old Cecília Camia Francisco, who is a student at the Teacher Training college. Both received gunshot wounds to their legs. “In all, three young people were shot. Two were admitted to hospital in Caluquembe itself while the more seriously injured student was taken to the provincial capital, Lubango, for treatment”, locals told Maka Angola. The incident began at 8am on April 11 just as the students was about to start their demonstration, when police swooped to arrest five young people. They were subsequently released. The protest, to demand the abolition of the recently-imposed requirement for emoluments, then went ahead. Witnesses say it was a peaceful, non-violent demonstration and there was no vandalism – until police officers suddenly waded in with flailing nightsticks. “The police began whipping people, resulting in some students picking up things to hit back. In the melee, the police lost control and were unable to force the students to disperse. Around 10.15am they opened fire and the situation continued with them sporadically firing into the air, until two National Police helicopters arrived from Lubango around 1.45pm,” one witness reported. Enquiries made by Maka Angola have revealed that these events occurred in the wake of an extraordinary meeting of the provincial committee of the ruling MPLA party, under the chairmanship of the Municipal Administrator, José Arão Nataniel Chissonde. He had summoned all the principals of the Professional and Technical Schools in the town to attend. The meeting decided to impose on students an extra fee of 3,000 kwanzas per month, with 2,000 kwanzas going to the schools and 1,000 kwanzas going to the Municipal Administration. According to Mr Chissonde the money was intended to purchase fuel for public lighting. Mr Chissonde also ruled that any student who failed to pay this “tuition tax” before the 11th of each month, would be prevented from attending classes. A source at the meeting says that Mr Chissonde then noted the absence of Abel Pedro, the Director of the Teacher Training College, who had sent a teacher in his place. In a fit of pique, Mr Chissonde decided then and there to suspend the director and his colleagues, without so much as giving them the opportunity to respond. Mr Chissonde went on to say that in the event the Director were ever to return (to the Teacher Training College), then he (Chissonde) would no longer be the Municipal Administrator,” the source added. When news broke about the “tuition tax” and the dismissal of the Teacher Training College director, the student body mandated their student union president to ask for an explanation. The response from the Municipal Administrator was that the matter was settled “and there’s no need to explain anything to anyone”. The Administrator also threatened to dismiss a geography teacher from the school “on the grounds he was from the Sinprof (teachers’ union) and was the Coordinator of Extra School Activities”. That was the spark for the student revolt. The presidents of the Student Unions of all five technical and professional schools met and decided they would stage a protest outside the Caluquembe Municipal Administration offices, to call for the return of the dismissed college staff and the removal of the new appointees. Given the student reaction, the new appointees have declined to take office. A source within the local authority told Maka Angola’s reporter that “all local administrations have received orders from on high “to suppress demonstrations at all costs”. One day after the incident, when questioned by local news outlets, the spokesman for the provincial command of the National Police in Huila, Chief Superintendent Paiva Chandala Tomás, initially denied that any of his officers had opened fire. But by Wednesday, he was obliged to acknowledge in a later interview with TV Zimbo that shots had indeed been fired by “one officer” and he would be punished. However, Maka Angola reached out to a number of different sources in the community and all concurred in saying that the officer alleged to have been responsible, named as Sergeant (3rd Class) Moisés Mununga, was on normal duty.